Welcomes you to the revolutionary new world of microemulsions and nano-scale technology. The result of this exciting scientific advance is Nano Green (also known as Agri Nano), a remarkable product that not only ushers in a new era in agricultural productivity, but also provides the foundation for a broad spectrum of applications, ranging from food processing to industrial, commercial and home cleaning. In its various formulations, it is also highly effective for a myriad of other uses including animal care, health care, oil spill dispersal and marine usage, aquaculture and soil remediation. 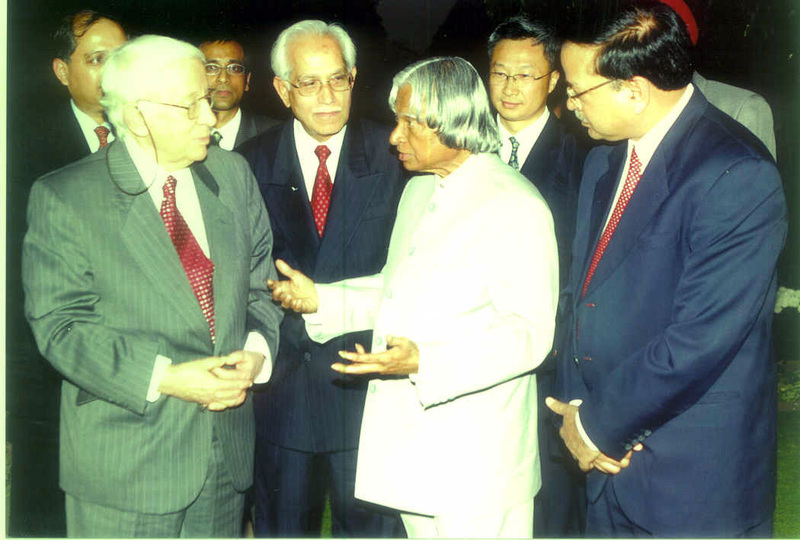 India’s President APJ Abdul Kalam asking Alvin Bojar about Nano Green and its application on crops as well as horticulture. Nano Green is the culmination of advanced developments in colloidal chemistry, which make it possible to produce a microscopic particle called a micelle. The micelle is comprised of a collection of linear molecules or fatty esters and fatty acids clumped together in the shape of a sphere that is about the size of 20 hydrogen atoms, or about one to four nanometers. For perspective, a human hair is 80,000 nanometers thick; a red blood cell covers 10,000 nanometers; a virus measures 100 nanometers across. These micelles possess the power and capability to break down organic molecules and hydrocarbons. They are the workhorses behind Nano Green’s effectiveness as a cleaning, emulsifying, degreasing and encapsulating agent. What is equally as exciting is that Nano Green is a true “green” product, made from extracts of corn, grain, soybeans, potatoes, coconut and palm, all on the list of FDA approved GRAS (Generally Regarded As Safe) and EAFUS (Everything Added to Food in the United States) food stocks and food additives. Because of its unique nano-scale particle size of 1-4 nm, it falls within the realm of quantum physics, in which conventional scientific thinking is no longer applicable. Thus, the remarkable results it has obtained in many areas of agricultural usage are still not fully understood. "Biobased products are commercial or industrial products that are composed, in whole or significant part, of biological products or renewable domestic agricultural materials." Completely non-toxic to humans, animals or plant life, Nano Green qualifies for a zero (“0”) U.S. government OSHA rating as a totally non-hazardous product. Even major overexposure will not result in causing adverse effects from swallowing, skin absorption, skin contact, eye contact and inhalation. Its fatty acid content provides Nano Green with the added attribute of being antibacterial, antimicrobial and.antifungicidal; it also possesses disinfecting and sanitizing capabilities. Nano Green contains no polyethylene glycols, benzene, triclosan or other chemicals, being blended, as stated, from FDA approved food stocks, yet its cleaning effectiveness equals or surpasses almost any detergent, cleaner or soap in the global marketplace today. Despite all its unique and remarkable qualities, Nano Green is surprisingly economical to use, offering product and labor savings of up to 50% and more, for agricultural as well as other applications.